At Hacking and Paterson we believe wholeheartedly in our Corporate Social Responsibility and regularly offer help and support in various ways to good causes and to those in need. Lee Kerr (left), Stuart Fraser (right) and Ian Vassie visited the Robin House Children’s Hospice based at Balloch on Thursday 26th April 2018. 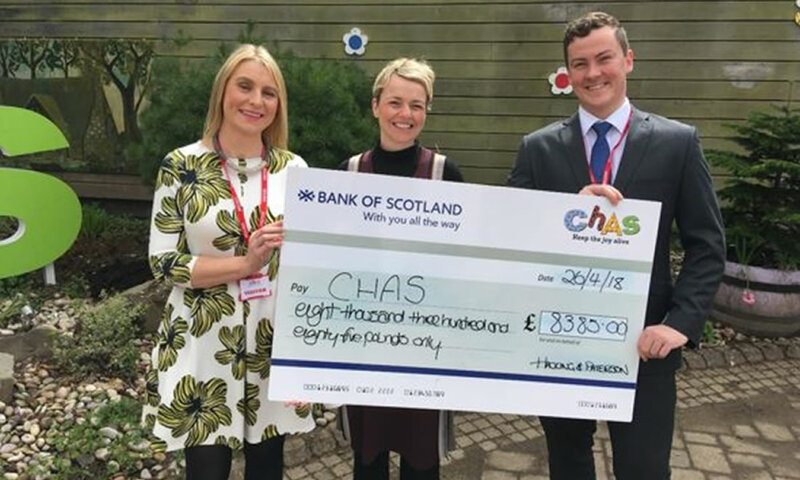 They met with Claire Benjamin (centre) of the CHAS organisation and were taken for a tour of the facility culminating in the Cheque Presentation. Clare Benjamin of CHAS commented: “Knowing that your child may die before you do, is the unthinkable reality that thousands of families across Scotland have to cope with every day. Each week, three children die in Scotland from an incurable condition. Children’s Hospices Across Scotland – better known as CHAS – is dedicated to supporting every single member of these families as they face the toughest challenge of their lives. We are committed to making sure no matter how short their time together may be, it is a time filled with happiness and fun. We make sure children have the opportunity for experiences they cannot have elsewhere, to feel the wind and sunshine on their faces, to sparkle, to laugh, to smile and to have those memorable moments of joy – moments that will be treasured forever. 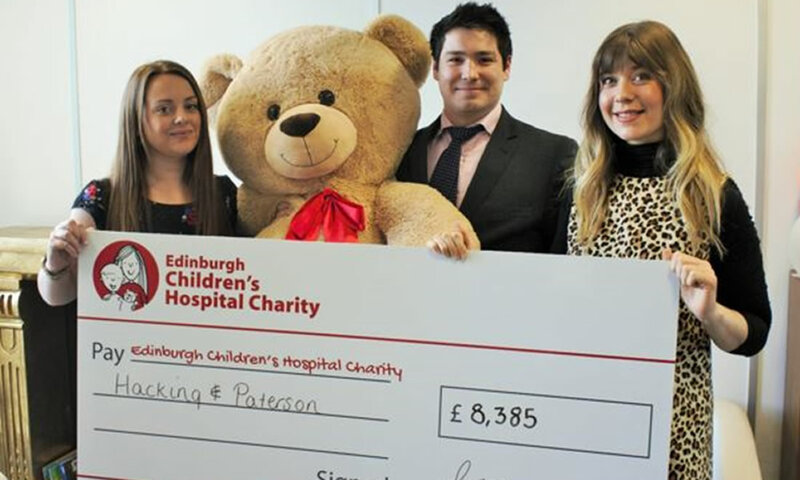 Emma Blair, Lucy Edgar (left) and David Jones (centre) visited Edinburgh Children’s Hospital Trust at their offices based in Danderhall on 25th April 2018. They met with Amy Ford and Tabby Blades (right) of the ECHC prior to presenting our donation cheque. Amy Ford commented: “Your donation helps us to provide visits from the Clown Doctors, magician, our dance performers and musicians and many more. This year we are planning over 700 activities within the RHSC, St John’s and other healthcare settings within the community, for children and their families. We couldn’t do this without donations from our supporters – thank you so much for your incredible donation of £8,385. We fund projects that help to ensure children and young people’s lives are less interrupted by illness, that they are less scared or stressed by their experience of hospital and just as importantly, they can continue to be a child first and foremost. We couldn’t do this without support – thank you”. Chris Graham (left “8”), Margaret O Grady (centre) and Ian Vassie (right “8”) visited the Beatson Facility based within the grounds of the Gartnavel General Hospital on Thursday 17th May 2018. They met with Joyce Ross and Kimberly McCourt of the Beatson Cancer Charity organisation and received a tour of the facility after which our donation cheque was presented. 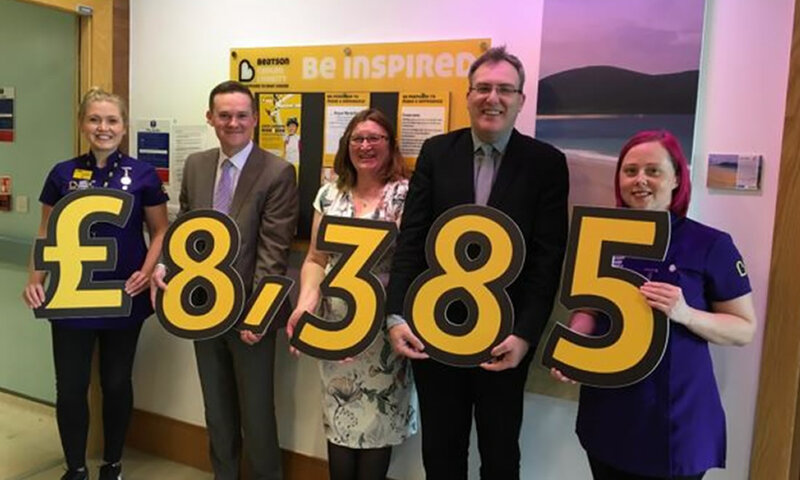 Joyce Ross commented: “Many thanks for taking the time to visit us here at The Beatson and for your kind and generous donation of £8,385…which is absolutely amazing and so very much appreciated by all of us. We do hope that you left with a better understanding of the vision of Beatson Cancer Charity and what happens to funds raised by organisations such as Hacking & Paterson”.